Spain possesses a fertile heavy metal and hard rock scene, of which the fast-rising HOLLOW CRY are the sonic proof - as evidenced with the arrival of their new album, From Ashes to Flames, which drops September 28, 2018, via Into Records. Hailing from the town of Tremp and initially started as a covers band in 2007, Xavi (lead vocals) had always wanted to start a band and on meeting a friend at a Taekwondo class who suggested themselves as drummer, the early formations of HOLLOW CRY took form. The wheels were in motion, shortly after Xavi recruited friends Marc, on rhytmic guitar, and Aleix on lead guitar, to give the band a more solid sound. EK-TOMBE had been born. In the winter of 2010. Playing metal turned out to be more demanding than expected, so after finding a replacement for the original drummer, Xavi began to focus solely on his singing and Marc picked the guitar to help Aleix with the melodies. Bass was needed, and the new drummer's cousin Joan joined the band. EK-TOMBE had given way to HOLLOW CRY. The guys had their big debut the following summer, in FestiPallars 2011, the biggest music festival of their region. They established a notorious fan base and kept playing in similar scenarios with crowds of 1-2,000 thousand people, juggling college, work and music, covering bands such as AVENGED SEVENFOLD and occasionally throwing in a few originals of their own. In 2012 they competed in Barcelona's biggest contest for emerging bands, Emergenza. They reached the final over a pop band whose members were disguised as farm animals, but the judges took a last minute controversial decision and left them out of the contest. The guys decided to focus on their own material then, and it wasn't easy. After a year of sporadic gigs, the band went into a one-year hiatus and didn't regroup until the fall of 2014, when Xavi told them he had composed songs of his own that could do well for a debut album. The band had been re-fuelled and reignited, ready to hit the road with more energy than ever. HOLLOW CRY entered the studio to record their first demo EP, meanwhile choosing their shows carefully, to ensure their music hits where it is most greatly received. 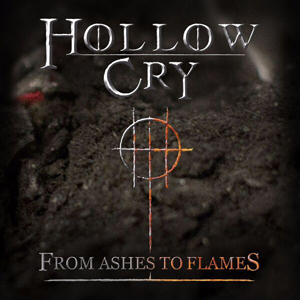 In recent months HOLLOW CRY signed to worldwide agency Metal Music Bookings and Management, and have undergone a revival; the name change to HOLLOW CRY (from WINTERSHADES), a new approach, and an array of epic tracks ready to be unleashed to the public. The underground metal scene is still emerging in Spain, and the newly launched HOLLOW CRY feel they are at the forefront. This is the result of that journey, the final leap, this is the beginning of HOLLOW CRY - and From Ashes to Flames is a mighty/bold step forward.